This one-day course provides a review of Competent Person duties and responsibilities in working with lead and other hazardous materials encountered in industrial coatings work. It also reviews relevant OSHA and EPA regulations. 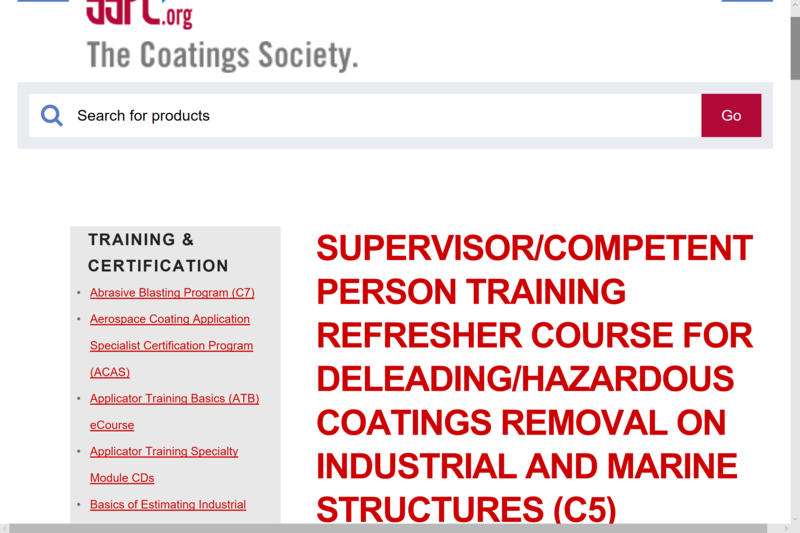 Recognize the duties and responsibilities of a Competent Person in protecting workers, the community, and the environment in the removal of hazardous materials during industrial coatings projects. Identify those OSHA and EPA regulations relevant to the removal of hazardous materials during industrial/marine coatings projects. Each participant will receive a comprehensive manual that includes copies of relevant standards and regulations. The written exam consists of 25 multiple-choice questions. To receive a certificate and CEUs you must attend all 8 hours of the course and attain a 70% or better score on the exam. This course was designed to refresh Supervisors/Competent Persons who have completed the SSPC C3 training and who are experienced at performing Competent Person duties on hazardous paint removal projects on industrial structures or components in the shop or field. Engineers, EHS, and other consultants and specifying or project managers who have completed C3 may also attend.